Will still weigh in the region of 5,000 pounds. We know that some major changes are afoot for the G-Wagen. In 2016, the G-Class will receive the first redesign since its launch back in 1979. According to Automobile Magazine, the heavily revised body-on-frame SUV will be widened by four inches but more significantly will lose 825 pounds by moving to an aluminum platform. Mercedes will attempt some aerodynamic improvements, while lowering the roof, adding LED headlamps and maintaining the slab-sided flanks. Inside, the entire instrument panel will be redesigned including a passenger grabhandle, differential lock push-buttons, and the latest-generation infotainment system with touchpad, larger in-dash monitor, head-up display and new steering wheel. 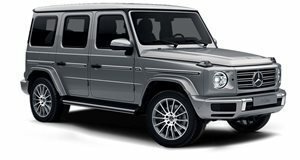 The entry-level G500 in the US will come powered by a new 4.0-liter twin-turbo V8 rated at 460 hp, while the G63 AMG will use a 5.5-liter twin-turbo V8 delivering 570 hp. A plug-in hybrid variant is also under consideration.